Luxury shopping, casinos and opulent architecture are some of the main reasons why travellers love visiting the Special Administrative Region of Macao in China. As a matter of fact, it offers such a wide range of entertainment options and hospitality services that many choose it repeatedly as a favourite destination for city breaks, business trips, celebrations, meetings and events. Furthermore, it is also frequently chosen because of its flexible travel visa policy, which allows nationals of a long list of world countries to enter the territory freely for tourism purposes as long as they stay for the specified limited period of time and travel with a valid passport that won’t expire in at least one month. Who can visit Macau without a visa? Visa exemption to travel to Macao in China is applicable to residents in Hong Kong (up to one year), visitors from the United Kingdom (up to six months), European travellers (up to ninety days) and those coming from Russia, Australia and the United States (up to thirty days), as well as to many other nationalities, so you are strongly encouraged to confirm your specific requirements and conditions with the corresponding official authorities at your local embassy. In some cases, you will simply be asked to apply for an entry permit upon arrival. Even when the city is worldwide known as a luxury destination, you can still find good value for money accommodation without breaking the bank and enjoy everything Macao has to offer. Below, we provide three recommendations that have been rated with three, four and five stars respectively so that you can decide which sort of hotel in Macau best meets your trip expectations. Strategically situated within short walking distance of centrally-located landmarks like the Guia Fortress and the World Trade Center, the Royal Dragon hotel provides the opportunity to enjoy a premium quality stay at an affordable rate. Its standard and superior guest rooms are fully-equipped with air conditioning, satellite TV, coffee amenities, a fridge for personal use, private bathroom and, in some cases, feature stunning city views. The experience of comfort and cosiness inside the rooms is complemented by an extensive choice of extra services, among which we count free WiFi internet throughout the premises, an onsite cocktail bar, a casino, round-the-clock parking, rooms for families, wheelchair accessible facilities and non-smoking spaces. Surrounding the hotel, travellers will easily find a broad selection of local restaurants and supermarkets, and those who are also curious about arts and history will be delighted to come across the Macau Museum of Art and the Macao Cultural Centre, less than one kilometre away from the establishment. 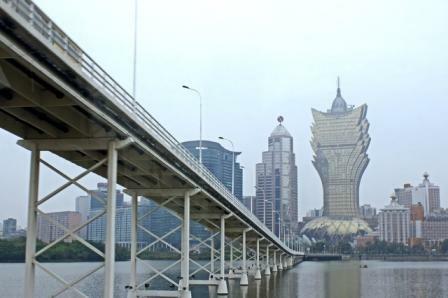 The closest airport is Macau International, which can be reached by driving across a bridge connecting the heart of the city with Taipa island; the journey takes about twelve minutes. Some visitors choose the ferry or shuttle buses as an alternative to driving. When looking for a good hotel in Macau, hospitality establishments like the Grand Emperor in the very heart of the city may truly meet the travellers’ expectations. Close to many luxury hotels, restaurants, casinos and shopping areas, its staff pay particular attention to ensure that your whole stay is seamless as well as to make you feel well taken care of. To start with, they provide airport pick-up service at no extra charge that must be requested during the reservation process. Their modern rooms and studios are ready to accommodate solo travellers, couples and families and cater for their every need with in-room amenities and ensuite bathroom. During their trip, visitors are entitled to a daily breakfast buffet inside the facilities, and can equally benefit from extras such as massages at the Thai Spa, delicious food at their three restaurants, a business centre to catch up with work and a casino to disconnect and have fun. Otherwise, if you feel like sparing some time for sightseeing, know that the Macau Government House, St Augustine’s Square and the Cathedral of Macao are all reachable on foot from this point. This 5-star hotel in Macao is located in the popular Avenida da Amizade, only a 10-minute drive from the airport and close to the Grand Prix Museum, the Fisherman’s Wharf, the Tea Culture House and the Hong Kong Macau Ferry Terminal, which offers wonderful views. The deluxe rooms and suites at the Grand Lapa feature different arrangements to accommodate individual guests, couples and families, and all feature a mini fridge, air-conditioning system, satellite TV and en suite bathroom with toiletries. The facilities comprise an outdoor swimming-pool, free parking spaces for guests, a spa centre and three restaurants specialising in Italian, Cantonese and Thai food respectively. For an absolute wellness experience, guests are invited to enrol in the fitness and yoga classes that take place on site.